Congratulations to "Janice H." and "Erin F.", the winners in Jessica's giveaway. Thank you to all who participated! Most books have a backstory—that ah-ha moment of inspiration or a simple idea the author knows can blossom into a full-blown book. 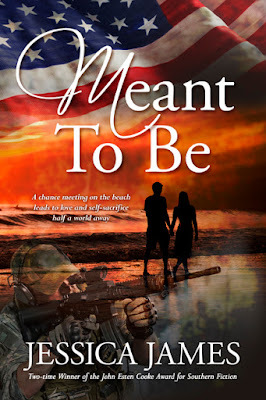 The seed of my romantic suspense novel Meant To Be was not quite so clear at the beginning, but no less obvious—if I had only been looking. The title may provide some indication of how the book came about. It all began on a trip to Ocean City, Md., to put finishing touches on my historical fiction novel Above and Beyond. I’d decided that a few days away from my normal writing space would help me wrap things up in one final swoop, rather than writing here and there when I could find the time. Great idea—except that when I sat down to write while staring out over the great expanse of the Atlantic Ocean, another storyline popped into my head. I tried to ignore it, but as I took my morning stroll along the beach, this story came back again. I ended up jotting everything down, having learned long ago that when the muse strikes, you need to listen. But I never had any intentions of doing anything with it. I was, after all, a historical fiction author—and this was a modern-day war story. Months later, I ran across the file in my computer called “Beach Notes,” and couldn’t believe how many pages I’d written. They were mostly just jumbled thoughts, some dialogue, parts of scenes, but there were dozens of pages on the topic of espionage and modern special operations in the war on terror. I still resisted spending any valuable time working on a contemporary suspense novel until some really strange “coincidences” started happening. For instance, I had the opportunity to sit down and have a beer with a retired Navy SEAL who was the sniper trainer for Marcus Luttrell (Lone Survivor), and worked with Chris Kyle (American Sniper), and was best friends with Glen Dougherty (killed in Benghazi), in my very own hometown of Gettysburg. And so I started thinking: how do things like this happen? What are the chances that a former West Coast Navy SEAL would end up in little, old Gettysburg in a Civil War era barn-turned-bar, talking one-on-one over a beer with me? I started working on the book in spare moments, getting as far as naming the characters and writing the opening scene. But I still didn’t want to devote too much time to it, because hey, I write historical fiction! Then I received an email from a reader, and when I answered her, for some reason I mentioned this new book—probably because I was so frustrated with how much there was to learn about special operations, the military, and the overall war theater of Afghanistan. She wrote back, “Do you believe in coincidences or Fate?” (I got chills right there). Turns out she was a linguist in the Air Force, working with Afghani women. She generously offered to help me with military issues, culture questions, geography, etc. Oh, and by the way, her name was Lauren—the same name as my main character. I finally got the message and put everything else aside to work on this book. I had to. It was meant to be. WHEN LAUREN CANTRELL said goodbye to the guy she had just met on the beach, she had no way of knowing their paths would ever cross again. But fate had another unexpected meeting in store for them—this time in a place where danger was part of the culture and the stakes were life and death. THE LAST PERSON in the world Michael “Rad” Radcliff expected to see at a special ops briefing in Afghanistan is the girl he met at the beach two weeks ago—the one he can’t stop thinking about. Update: MEANT TO BE was published in June 2015, and won the 2015 New Jersey Romance Writers Golden Leaf Award for Romantic Suspense. Due to a mix-up at the printer, I have two left-over Early Review Copies of Meant To Be to give away. I’d love to know if you have had a similar experience—tried to ignore something that just wouldn’t let you go. Giveaway ends 11:59pm EST March 11th. Please supply your email in the post. You may use spaces or full text for security. (ex. jsmith at gmail dot com) If you do not wish to supply your email, or have trouble posting, please email maureen@justromanticsuspense.com with a subject title of JRS GIVEAWAY to be entered in the current giveaway. Wow. Definitely a shiver-inducing story! I have stories that won't let me go, but nothing I've given in to when I "shouldn't" but mostly because 1) my ideas haven't strayed far from my core and 2) I'm lucky enough not to have reasons for "shouldn't" most of the time. But nothing that has ever been fated like that! Congratulations on the success of the book so far. no I haven't but I'm enough of a romantic that I would love a meet cute like that! Thanks for sharing! I have had experiences where I had a thought or feeling that just wouldn't go away. A few years ago we had had a lot of rain. My son had 'cabin fever' and was going to go in to town. I talked him out of it because I had a feeling that it just was not a good idea. About an hour later the storm hit. The massive storm cell sat over us for an hour. The creek rose from a small trickle to 10 metres in 7 minutes. The flash flood was practically biblical. At best my son would have been trapped on the other side, at worst he would have been on the road and swept away. A township downhill from us was practically wiped off the map. Wow! Glad you listened to your female intuition. The was definitely meant to be.